In his article, Heisenberg said he understood the mathematics of Lorentz transformations, but could not comprehend Einstein's simultaneity or time separation. Since then, this webpage has been the most popular page among the many webpages (nearly 1000) I maintain. In this 2005 page, I review an article Heisenberg wrote about Einstein. I point out there that Heisenberg had a great respect for Einstein, but he expresses his frustration over Einstein's refusal to accept his interpretation of quantum mechanics. 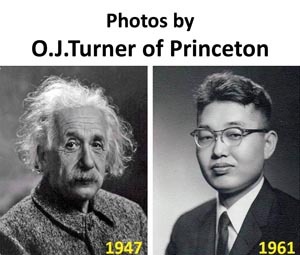 These days, there is a tendency to exaggerate the difference between these two great physicists. 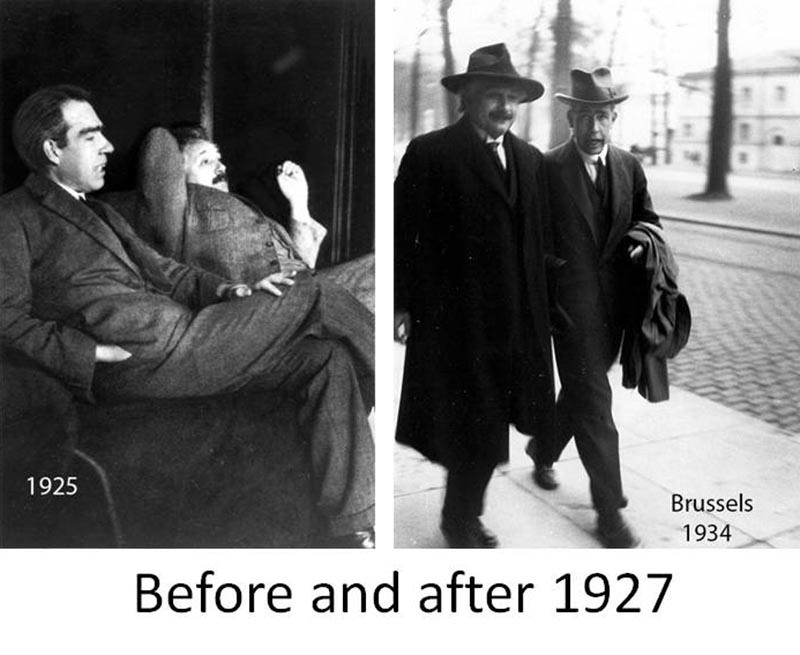 Many people say that Einstein was totally against quantum mechanics. This cannot be true. Einstein's photo-electric effect was one of the first manifestations of the wave-particle duality. Then where was the gap between Einstein and Heisenberg. 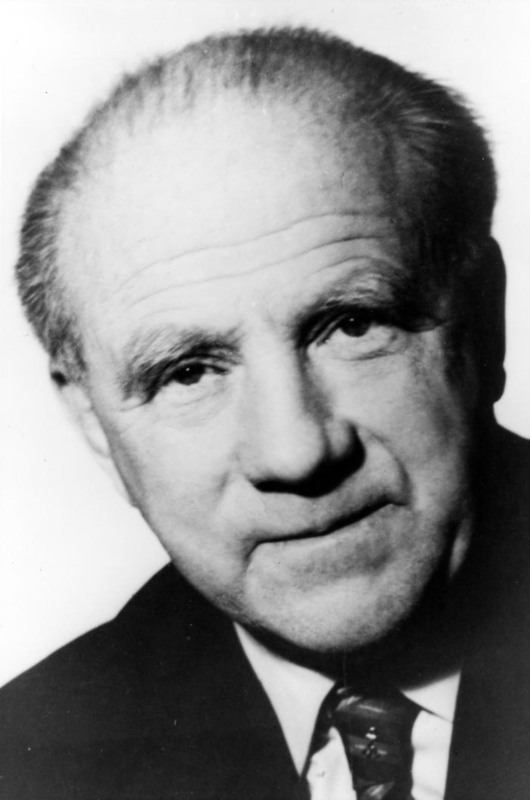 Heisenberg, while talking about Einstein, said he did not have difficulties in understanding the mathematics of Lorentz transformations, but he could not comprehend Einstein's concept of simultaneity. Let us consider the distance between the proton and electron in the hydrogen atom. This is a space-like separation when they are observed simultaneously. This is called the Bohr radius, one of the most important quantities in quantum mechanics. When the atom moves, the space-like separation picks up a time-like separation. Was Heisenberg alone having this difficulty? The answer is NO. 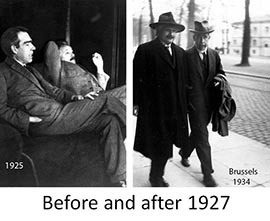 Einstein and Bohr met frequently before and after 1927, to talk about physics, presumably about relativity and quantum mechanics. However, there is one important aspect they did not discuss. Click here for what they did not discuss. This is the question of simultaneity Heisenberg was talking about. Even these days, this time-separation variable is the most difficult item for me to talk about at conferences. The Physical Review used to reject my papers whenever I explicitly mentioned this variable, insisting that it does not exist in quantum mechanics. 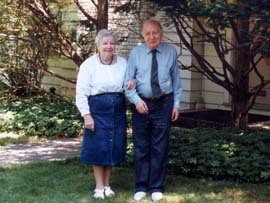 Mr. and Mrs. Wigner at their Princeton house in 1991. This photo is available from AIP for $20.00, but you can get it free from me. Send an email to yskim@umd.edu. Since 1990, I have been talking about this time-separation variable in terms of Feynman's rest of the universe. 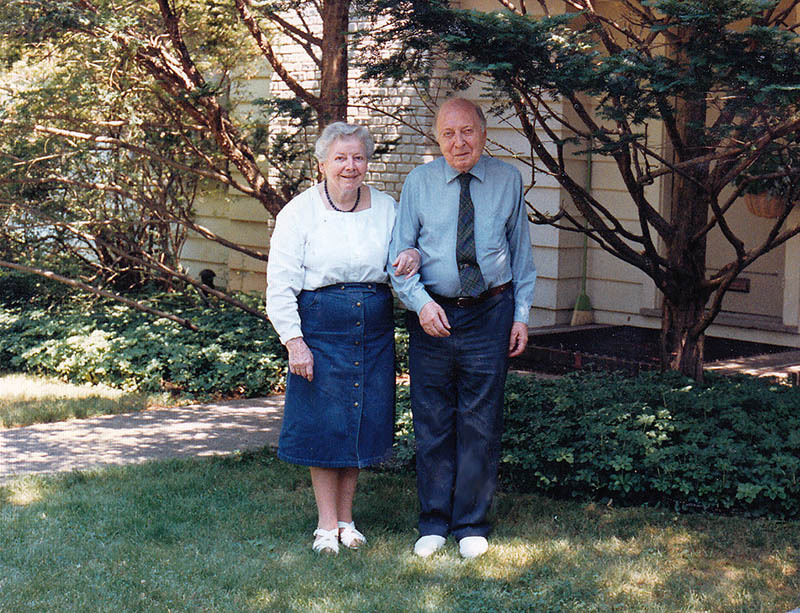 I was fortunate enough to publish my paper with Eugene Wigner on this subject in 1990. Wigner was aware of this time-sepration variable as well the c-number time-energy relation introduced by Dirac in 1927. Clck here for a webpaged version of this paper. Easy to follow. I now choose to translate this paper into the language of entanglement, and examine further consequses. This series appears very frequently in the literature these days. It is for the Gaussian entanglement of the x and y variables. Did you know this entanglement series can be written in the following Gaussian form? Click here to see how the entanglement series can be derived from the Gaussian form of Eq.(1). This matrix is clearly the formula for the Lorentz boost along the z direction. 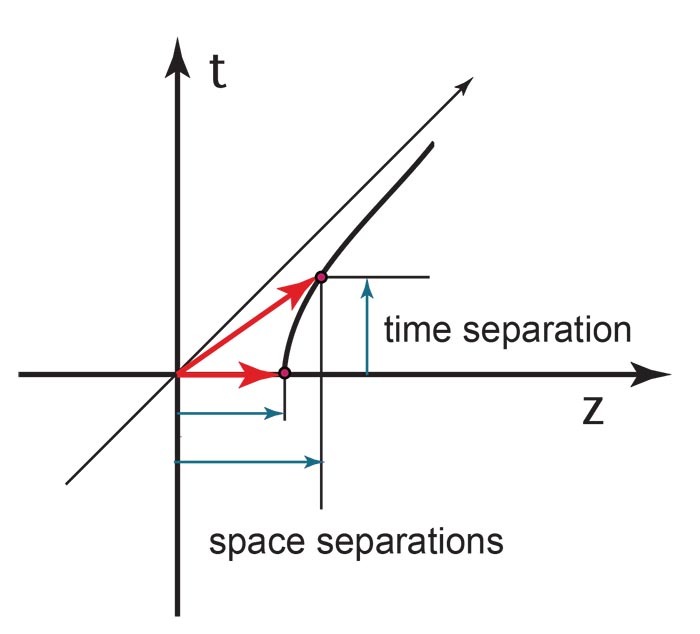 This means that the Lorentz boost entangles the space and time coordinates. If we Lorentz-boost the Gaussian form of Eq. (3), it becomes the entangled state of Eq.(2). Both Yukwa and Dirac attempted to construct Lorentz-covariant quantuem mechanics using harmonic oscillators, but they did not have enough experiemental data to rely on. Click here for a stroy. The history of Eq. (4) can traced to Yukawa's 1953 paper on harmonic oscillators for internal space-time structure of elementary particles. Click here for a story. 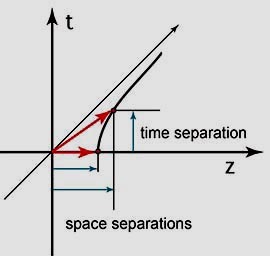 In his paper, Yukawa clearly said z and t are the space and time seprations respectively, but he could not say what the constituent particles are. The quarks were unkown in 1953. The time-separation is in Feynman's rest of the universe, and this problem can be studied in terms of von Neumann's entropy. Click here for a detailed story. You have seen this page before. Let us look at another consequence of the space-time entanglement. The harmonic oscillator is applicable to high-energy hadronic physics. Its mass spectra are like the degeneracy of the three-dimensional oscillator, and the ground state oscillator wave function can be used for a reasonable approximation for the proton. In the three-quark bound sate for the proton, there are two independent oscillator modes. We can express the entangled Gaussian form of Eq. (2) for the Lorentz-boosted proton using squeezed circles, and construct the following figure. 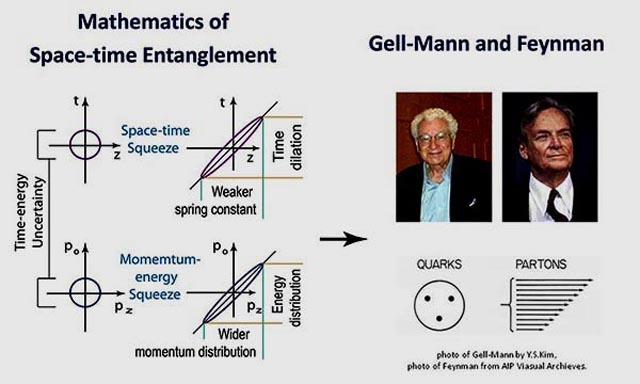 Gell-Mann's quark model and Feynman's parton model tell different stories of the proton. The entanglement diagram shown above tells the quark model and parton model are two different manifestations of one Lorentz-covariant entity. Click here for a more detailed story. It is gratifying to note that the entanglement series becomes a squeezed Gaussian function which then leads to the language of squeezed circles. The word "entanglement" is highly contagious these days. If you are infected, you are OK. You are now entangled with Einstein. copyright@2016 by Y. S. Kim, unless otherwise specified. The photo of Heisenberg is from the public domain.